From the age of eight years I was made aware that University followed after school ended. So in my sub-senior year at high school I decided that dentistry would be my career. I was one of the 26 who graduated from the class of 1955. Now reduced to 13, our frequent class reunions are more and more keenly anticipated, with the suggestion that we should meet six monthly being considered very seriously. Alongside receiving guidance into the obligations and expectations of students, certain liberties were taken in the form of student pranks, irreverent singsongs and the Commem Ball. These were led mainly by the college students. In my mind, the outstanding prank of all time parodied the sensational contemporary newspaper reports that an abominable snowman had been discovered cavorting over the Himalayas. The local Telegraph evening newspaper even published a front-page photo of its purported footprint in the snow. One morning the Chancellor observed that there were four large black footprints tracking up ‘his’ Forgan Smith Tower. He was quoted as thundering ‘Those footprints must come down!’. He was obliged. The next morning they re-appeared–but inverted; the abominable snowman had returned to the ground. Both events were recorded as front-page photographs in the two subsequent issues of the Semper Floreat. Then there was the traditional procession through the city streets, starting at the botanical gardens and featuring the engineers’ boastful polyfunctional Chinese dragon as well as many more other clever ingenuities. Before proceeding, the police would arrive, censure and destroy all rude, bawdy and obscene placards on display and leave. The hidden duplicate replacements would be rolled out and paraded to the amusement of the office workers and shoppers in the city. Then suddenly, the serious business of lecture programmes began. We were bundled in with the medicos and the physios on the St Lucia campus for the basic sciences. In those days one attended lectures neatly dressed in pressed trousers, ironed shirt and with a tie. Over our four-year course we trundled between the St Lucia, George St, Victoria Park, Herston and Turbot St campuses. Often several times in the one day. We discovered that if we could sneak an (illegal) fifth person into a taxi cab that the cost of the transport compared very favourably to that of a tram. Ten pennies saved meant a glass of beer. If one could borrow their father’s car it could be parked almost anywhere at St Lucia, including the Great Court which was then devoid of grass. A couple of years later in our final clinical year, one of the lusty lads, having fallen into desire over one of the lovely and gorgeous surgery assistants, decided to try his luck by following her into the dark room where she had gone to develop a radiograph. Once inside, in the loom of the safety light, spotting a white-gowned figure leaning over the developing tank, he audaciously pinched the gown’s bottom. ‘What do you think you are doing!’ was the unexpected response. It was the Deputy Dean. We never did learn his fate. Although there was much speculation that, whatever it was, it would have been far worse had his approach been welcomed. We graduated from this university as highly competent practitioners into a learned profession, of no danger to the public. Enabled and capable of understanding and absorbing the processes of further education and research. For this continuation, we acknowledge that we are ever grateful to our academic colleagues within and without our university. In a sense we have never left. This may explain, in part, the reason I enjoy so much the benefits of membership of Alumni Friends, and my support of its many activities, particularly now in its Golden Jubilee year. 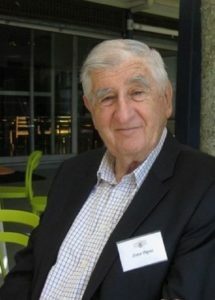 Stephen Papas, Bachelor of Dental Science 1956, Brisbane. This entry was posted in Family and tagged “Semper Floreat, 1950s, Commem, dentistry, footprints, Great Court, pranks, transport. Bookmark the permalink.